Dublin, mid 1980s. 14-year-old Conor is transferred from a posh private school to the local comprehensive – a hostile territory of bullies and priests. 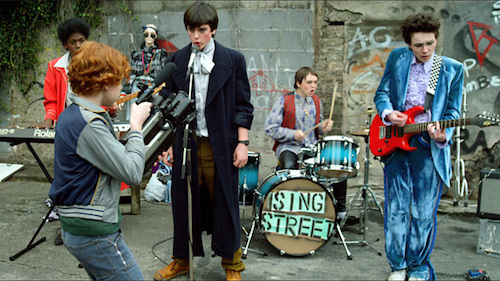 In a bid to impress a girl and make friends, Conor rounds up a gang of lads to form a band. Under his older brother’s guidance, they distill the likes of Duran Duran and The Jam into their music. 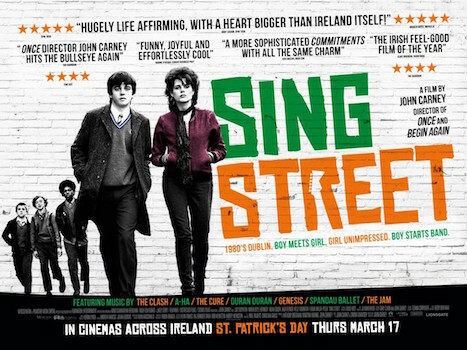 Imbued with popular 80s hits, Sing Street is an intoxicatingly enjoyable experience. Director Carney (Once) pulls strong performances from the young cast, expertly balancing drama and comedy. This Review, from the Guardian – here includes a link to the Official UK Trailer while the Official (US) Trailer, without text to wade through, is below…..